Microsoft has published Microsoft Exchange 2016 download. 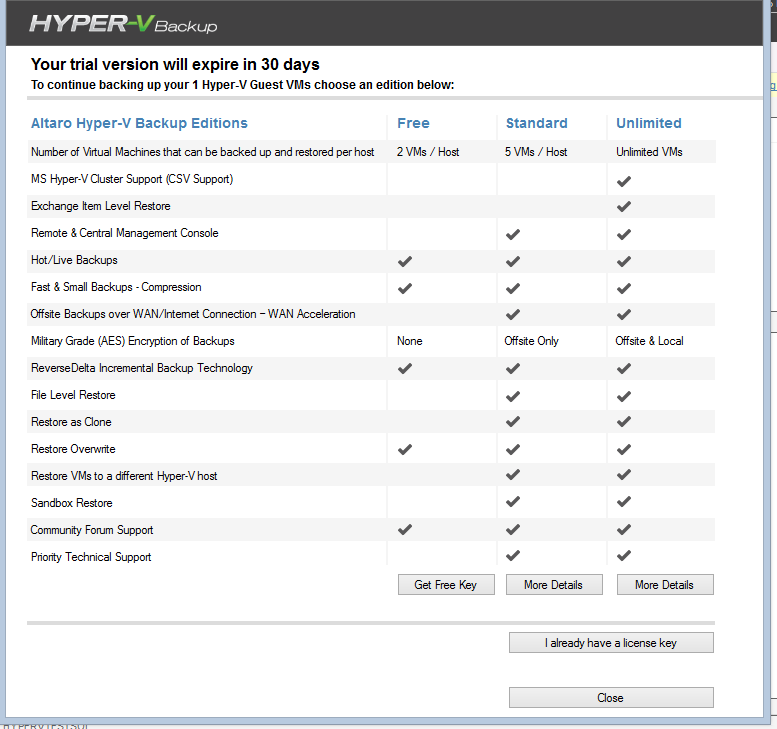 Comparison of free applications which could be used for backing up Hyper-V Server and virtual machines. Presented applications was tested using Microsoft Windows 2012 Hyper-V, Windows Hyper-V 2012R2 and Windows 8.1. For the most part they act identically on Windows Server 2008, Windows Server 2008 R2 and Windows Server 2012. Microsoft wanting to remain a major player in the virtualization market, provides a free version of its operating system, Windows Server - Hyper-V Server 2012 and 2012 R2. 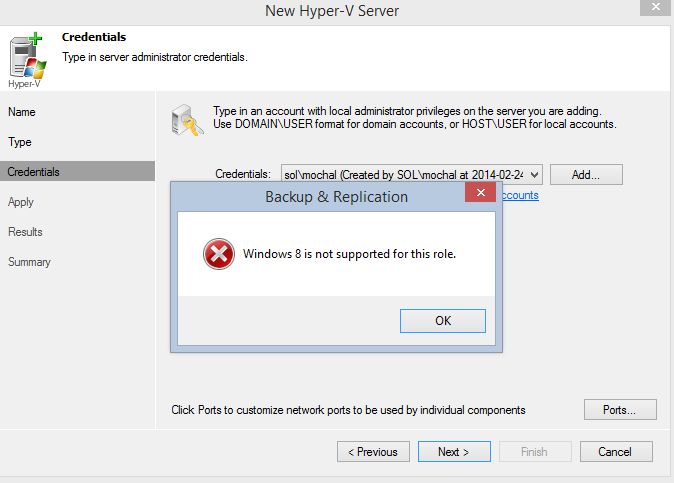 Hyper-V Server is a Core system version, without graphical interface (GUI). This makes it faster and run happily with fewer resources, leaving the computing power and storage space for virtual machines. On the hypervisor (the control unit of Hyper-V) we could run virtual machines which we can secure by creating backup copies. Ways to achieve this objective are few. With a free operating system, we can also use the free applications, though they do not have very powerful capabilities, they does meet the basic tasks to secure a copy of machine in the event of failure or the need to restore its state. Microsoft Hyper -V Server 2012 and the whole family of Windows Server (since 2008) as well as Windows Vista, 7 , 8 and 8.1 have wbadmin tool wmbedded, run from the command line. Wbadmin allows you to backup and restore your system from both the local disk and network share. It is a simple and effective method for managing safety copies . Its drawbacks are the lack of transparency and flexibility . The advantages are simple syntax and choice of items that you want to move to a backup. Wbadmin allows you to backup entire physical disk or selected elements , such as C: \ drive , mount point , systemstate , virtual machine 1 and 2, etc. Overview for backups done can be done through the command line too. All available through the hypervisor . Wbadmin can also use powershell scripts or run it in a scheduled timetable . Wbadmin we get together with hyper-v . One of its advantages is possibility to create a backup of both the hypervisor and virtual machines that are running on it . The main disadvantage is stopping the virtual machine (as Saved ) on the duration of the backup , which often disqualifies this solution . It can be used for machines that do not require continuous operation , such as file servers , or others that during the backup window does need to function in production . Another tools that I will present , already have GUI. There are free versions of commercial solutions , with limited possibilities . Each of them can be easily changed to full product by purchasing a license key . Veeam Backup has a clear interface and is available with a separate console for Microsoft Exchange mail servers . The full version of the product has gained good opinion in the IT administrators world. The free version is very stripped down . · How many virtual machines includes a free license? Veeam Backup is installed on your computer / server where it acts as manager. At the beginning the cold shower : the program does not work (yet ) with Windows Hyper- V Server 2012R2 and Windows8. When you start dealing with the program you can see interface similar to Microsoft Office. 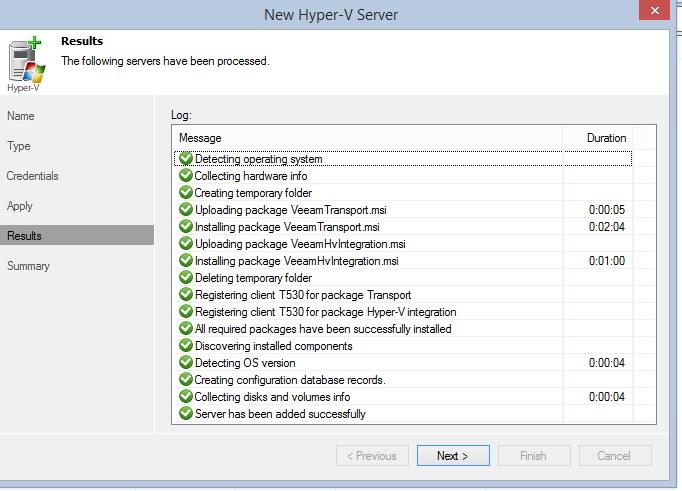 You can add VMWare vSphere and Hyper –V servers to console . To make it possible to connect to the remote hypervisors , RPC traffic must be open. When you first connect , the client is forced to install Veeam transport agent on the host. Once we have access to virtual machines , we can carry out their backup . The free version is only available with a single backup option . It is not possible to use the schedule. The scheduler mode is available for copying files from the hypervisor , but does not give us a full , consistent backup for virtual machines. Accordingly, the functionality of the program falls to marginal use in emergency situations. Backup is made via the VeeamZip and saved to the location as the .zip archive. 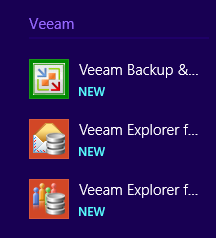 All available for Windows system where Veeam Backup is installed . - Native support for tape libraries. 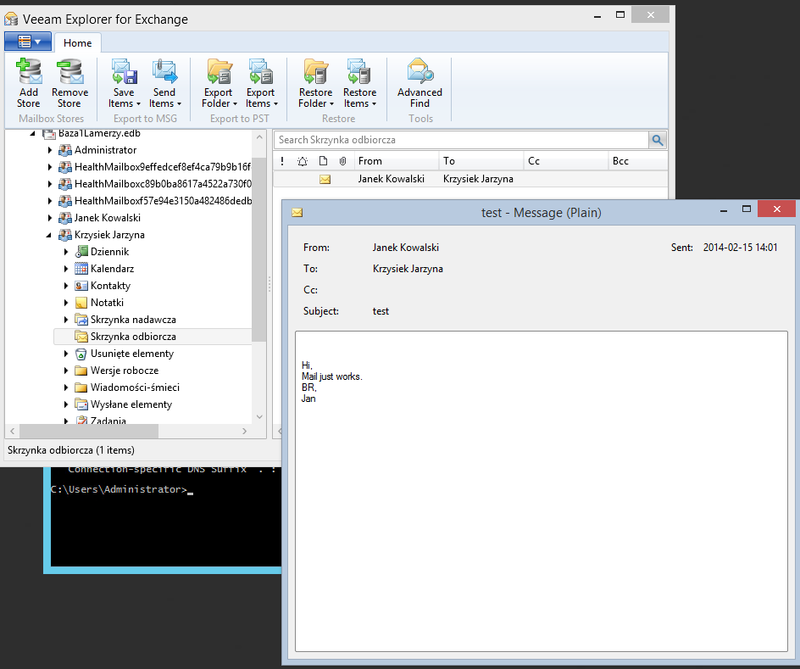 Exchange console can theoretically be used only on the local Exchange server. In practice however, after copying database files, log files and Ese.dll library you will be able to browse mailboxes and their contents - even the content of e-mails ! 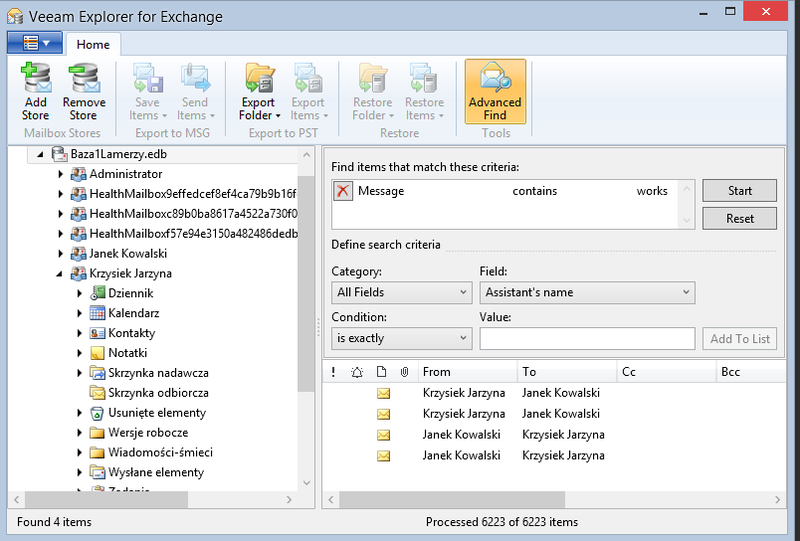 You can also export the mailbox to .pst file and search the database to record the occurrence of the selected criteria. All this functionality for free, in a nice graphical design. This tool is and will be useful for Exchange administrators. Veeam Backup does not offer much for backing up virtual machines in the free version. Accurate documentation available on the network and from the program however shows that he has great potential - if we decide to purchase a license . Another backup system which is available in addition to the commercial version also for free with truncated functions. At the beginning I must praise the excellent documentation available directly from the program help. It describes every possible function in an easy fashion. It's one of the best systems help I have seen. 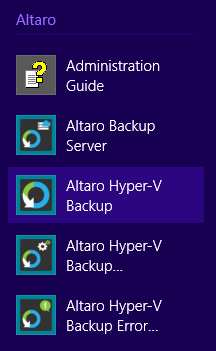 Altaro backup needs to be installed directly on the hypervisor by copying and running the installer. System can operate from the hypervisor using a graphical interface. It is also possible to install a remote management console if your operating system is in 64-bit version. The free version allows you to use Altaro Backup on two virtual machines. 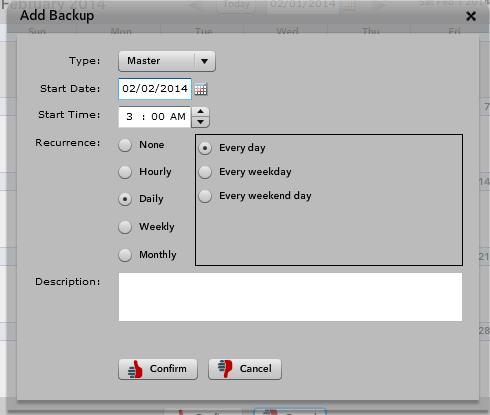 Backup can be performed using the task scheduler. This is a big advantage of the free system. This allows us to use it in a production environment. 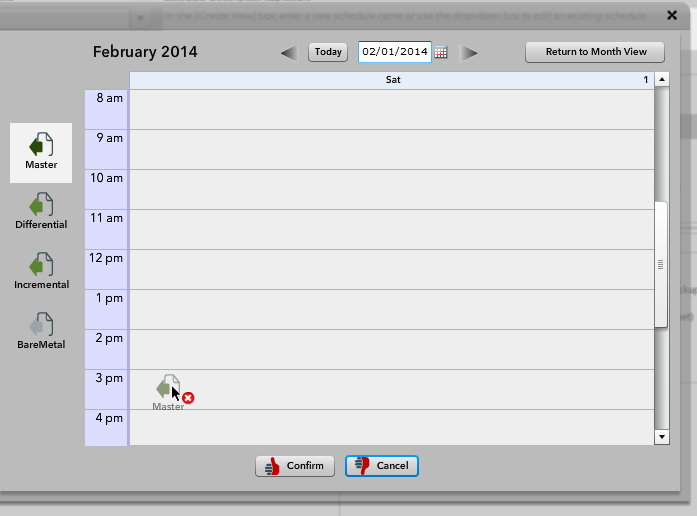 Interesting is the possibility of checking of all scheduled tasks in the calendar. We have the ability to perform an incremental backup. In combination with the possibility of scheduling tasks, get backup system with basic functionality for free. (if you do not need to handle more than 2 virtual machines - see licensing ) ! It's something else entirely. Yes, it is an application to backup virtual machines. However, the Unitrends company approached quite differently to the topic. The application is actually a virtual machine with Linux installed. As a result, it does not have the limitations of Windows , and allows you to backup almost any operating system, including the fact that ... backuping machines does not have to be a virtual machine. I was able to make a copy of my physical computer. 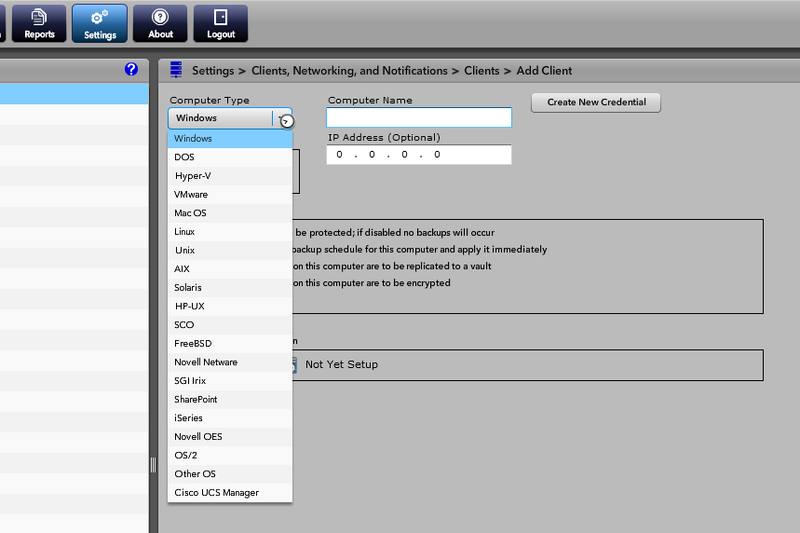 The free version allows you to backup the eight clients (hosts). All of the features of the application is not blocked in any manner. In accordance with another backup system architecture presented here the installation looks different too. On the hypervisor for which the installation file has been copied to, after running it additional virtual machine called Unitrends Enterprise Backup will be installed. It is satisfied with 512MB of memory ( but better allocate it 1024MB). After logging in to the machine and setting network connections, application is maintained via web browser . This allows us to handle it from anywhere , which is very convenient - you do not need to have access to a computer with the installed application, differently from the rest of the previously presented programs. In addition, you must install the client software on any supported host. This should be done from the machines, which we will manage. Given that the free version can only do it on eight hosts, it is not too labor intensive. For Windows three agents are available - 32 bit, 64 bit and BareMetal, so that we can recover a functional operating system, not just the files. Another plus for Unitrends - support for all known operating systems. In addition to Windows and various Linux distributions, is MacOS, Novell, HP-UX, Solaris, and many others. I personally tested the Windows and Linux clients. For Linux you had to do some tricks if you have 64bit version of the OS,because there are only 32-bit version of the Linux client is available. Finally, however, I succeeded after installing the 32-bit libraries . There is available an advanced backup schedule, along with a choice of several pre-configured profiles . We plan to backup through operations on the calendar - add an option to copy full, incremental or which is unique in the free system - also differential backup. Exchange server backup for free! We have the ability to backup the virtual machine with the Exchange server and recover the database and files. We can recover the database directly on the Exchange server, to recovery database or recover to a designated location. 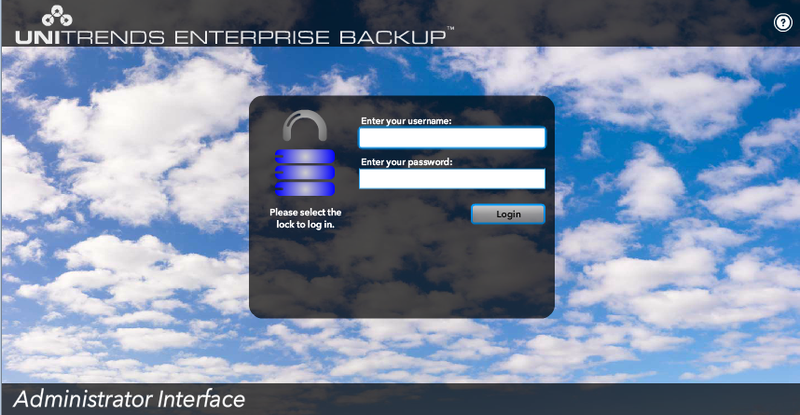 Unitrends Enterprise Backup is the most advanced of the presented backups applications. It allows to make a full backup and recover not only files, but also the operating system of both the virtual machine and the physical computer . A big plus is possibility to backup machines with non-Windows operating systems. User friendliness and interface transparency is in my opinion worse than in Altaro Backup, but the functionality of the free version is the highest. Which one I should choose ? If you have only two virtual machines to back up, I recommend selection of Altaro Backup , which does not cause any trouble to install and configure, has extensive documentation and high-speed operation , and you can schedule the backup . When your environment requires more handling equipment including physical hosts I will choose Unitrends Backup. But when your job is to manage the backup for more machines, consider purchasing a license, maybe one of the presented applications. You can of course use wbadmin without restriction , but the functionality of the system commands is limited. For all Exchange administrators I recommend Veeam Backup console program . When you change password which is used by HP Insight Manager services, then you suddenly cannot access management page. Then you see application window like below or similar, but web browser management windows not appears anymore. HP Insight Manager application runs as java jboss script. You've just changed Windows password, but application settings were unchanged. I spent some time to resolve the problem, but it was worth doing so. Article says about changing only the HP Insight Manager Service account. What about other services which are dependent? First you have to answer yourself what changes you were made, i.e. have you changed only user password which is used for running service/services? 3.In the window select modify the MxDBUserPassword and enter new password. If you've changed the account on which services works, then you have more to do.Link from HP side that I'm provided earlier is good for the start.But it could be not enough to resolve this problem. If yes, you should try to restart it and check if the logon error appears. If errors appears, you need to reenter password in the service logon in service properties page. 2. Run SQL Management Studio and connect to the HP database. 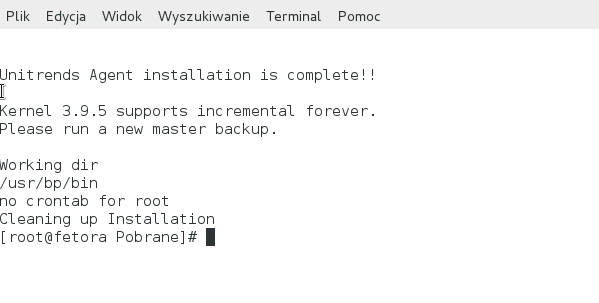 If you did not installed it on the HP mananagement server you can connect to it remotely. 4. Check user rights - it should have sysadmin and dbcreator rights. In the line connection-url, you should use DOMAIN://SERVERNAME:1433 and in the domain=DOMAIN again. 8. Run task manager on the server which have HP Systems Insight Manager. At the end you could have Completed or Error status. 1.Try to restart HP Insight Manager service and run mxinitconfig -a again.